Part memoir, part spiritual exploration, part inspiring stories, Expect the Unexpected provides knowledge and support for tapping into spiritual realms we do not fully understand. Bill Philipps had the kind of childhood that seems too tragic to be true — drug-addicted parents, parental kidnapping, homelessness. At fourteen, he watched his mother die. Two days later she appeared to him, letting him know she was spiritually alive. From then on, spirits “knocked on his door.” He tried to ignore them. He wanted to be “normal.” But as he pursued his singing gift at the San Francisco Conservatory of Music, his psychic gift pressed for a hearing. As Philipps gave readings as a psychic medium, witnessing the comfort the spirits offered, he came to accept and honor his abilities. With testimonies from many people, Expect the Unexpected is an honest firsthand account of how spirits communicate with Philipps, why he believes they chose him to do this, and how he works with them to ultimately convey their messages. He offers insight and suggestions to help ask for and receive signs with or without a medium and shows why he is convinced that readings always contain the possibility for love, peace, healing, and hope. 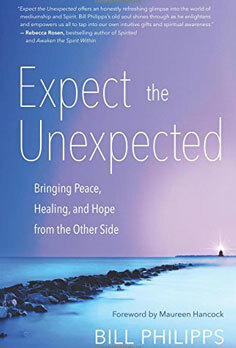 Expect the Unexpected offers an honestly refreshing glimpse into the world of mediumship and Spirit. Bill Philipps’s old soul shines through as he enlightens and empowers us all to tap into our own intuitive gifts and spiritual awareness. To read Bill Philipps’s writing is to be held by his spirit. He is a force of goodwill on this earth, and he heals hearts. His stories teach us that mediums are real and that passing on is not scary but simply a change in location, to a location that is only accessible with an open heart. I am grateful for Bill Philipps. I am grateful for his book. “Expect the Unexpected” officially available in all stores! Expect the Unexpected #1 again!! 5 Star Reviews Across the Board! Missy Jenkins Smith’s book available for 2016 school year!